At the outbreak of war in 1914, Horace Moore-Jones was living in Britain. He was 42 years old, but gave his age as 32 so he could enlist with the New Zealand Expeditionary Force (NZEF). Moore-Jones was sent to Gallipoli with the Engineers, but was soon deployed to draw topographical maps of the area for military purposes. Towards the end of 1915 his drawing hand was injured. While recovering in England, he somehow managed to produce nearly 80 watercolours of Gallipoli. You can imagine what it must be like to live, day after day, facing plateaus that are covered with one’s dead comrades, whose faces had grown black by the time we could reach them, and the over-powering sickening stench. And what it meant to sit, eating one’s bread and jam surrounded by millions of flies who had been bred on dead bodies. Moore-Jones’ most widely recognised work was not painted at the battlefront, but from a photograph. 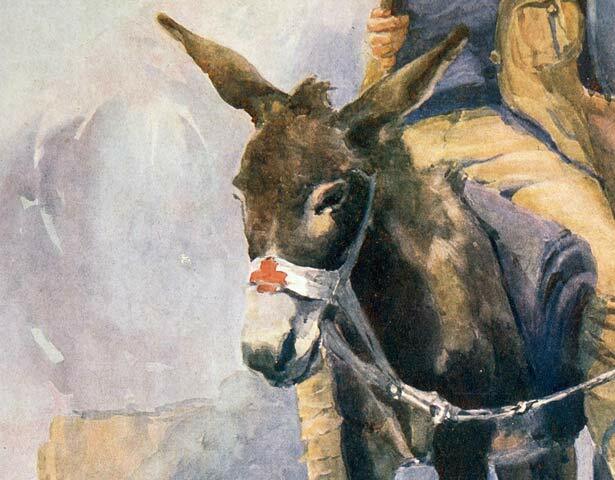 His depiction of Private Simpson and his donkey was done when Moore-Jones was showing his watercolours in Dunedin in 1918. He altered the composition of the photo to make the image more dramatic. Moore-Jones died of burns suffered while rescuing people from a Hamilton hotel fire in 1922. We have 1 event in history, 7 biographies, 4 articles, related to Horace Moore-Jones.